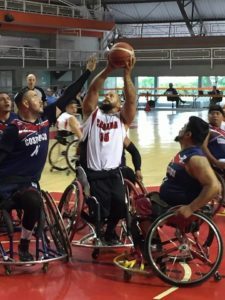 (Cali, Colombia) The Canadian men’s team improved to 2-0 at the 2017 Americas Cup with an 86-29 win against Costa Rica on Thursday afternoon in Cali, Colombia. After tip off Canada and Costa Rica battled for control of the game as the teams went shot for shot until Canada hit their stride with a 15-2 point run in the first quarter. Costa Rica was unable to push past the Canadian defense to match the blistering pace and quickly fell further behind as Canada climbed to a 45-13 advantage by halftime. The Canadian team kept up the strong push in the second half as they worked towards their victory. All 12 Canadian players got into game action and contributed to keeping the Costa Rican offense at bay. Ben Moronchuk, of Edmonton, Alta., produced a team-best 17 points for the Canadians. Teammate Nik Goncin of Regina, Sask., dropped 14 points, while Bo Hedges (Wonowon, B.C. ), added ten points for Canada. The Canadian men next play Venezuela on Friday, August 25 at 8 pm ET in their third game of round robin action. View the full schedule and results. 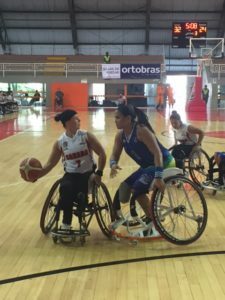 The Canadian women’s team also added a second game to their win column with a 62-42 victory against Brazil. With the win the women solidify their spot as one of the top four teams in the tournament to qualify for the 2018 World Championships in Hamburg, Germany. Canada pushed ahead of Brazil in the opening quarter to forge an 8 point lead thanks to sharp shooting from Arinn Young (Legal, Alta.). The Brazilians responded in the second by increasing the pressure on the Canadian offense and outscored Canada 12-9. Returning with a renewed intensity after halftime the Canadian side widened the gap by nearly doubling the Brazilian output in the third quarter. Canada kept the Brazilians out of reach in the final stretch and ended the game ahead 20 points. “We didn’t play what we had predicted in the first half, we had a good challenge and Brazil was a good team. We came back strong in the second half and the ladies played very strong after refocusing and regrouping as a team,” said the Canadian women’s head coach Marc Antoine Ducharme. Canada’s Young led her team with 27 points, while Cindy Ouellet (Quebec, Que.) added 12 points. The Canadian women next play the United States on Friday, August 25 at 4 pm ET in their second game of round robin action. View the full schedule and results.